There are some common problems that make the circuits we designed not work as our expected. Many failure modes have been collated by Brophy and Voigy in their review (Brophy and Voigt, 2014). In our project, we mainly focus on two modes, crosstalk and host overload, that emerge especially when we create more sophisticated systems. More specifically, regulators may interact with each other’s targets leading to errors in the desired operation, and the synthetic circuits may compete with natural parts that maintain the normal cellular processes for limited resources. In design 1, the processing module is similar to the classic repressilator, which is composed of three NOT gates. cI represses tetR, which represses lacI, which represses cI. What's different is that the transcription directions of these three genes in our design are no longer the same as that in the classic repressilator. This is because we want to put two promoters more closely. And we add a pair of reversed lox sites on either side of the promoters (Fig. 1). After rewiring the circuit, the regulatory relationship among these three genes is altered. It is now that cI represses lacI. So cI and lacI inhibit each other. 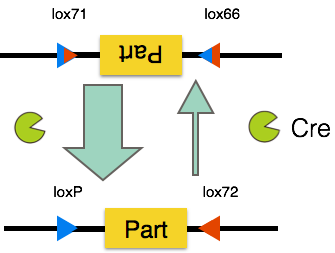 And the repressilator which is composed of three NOT gates is rewired to be a toggle switch composed of two NOT gates(Fig. 2). In design 2, the parts we used are from a quorum sensing system. 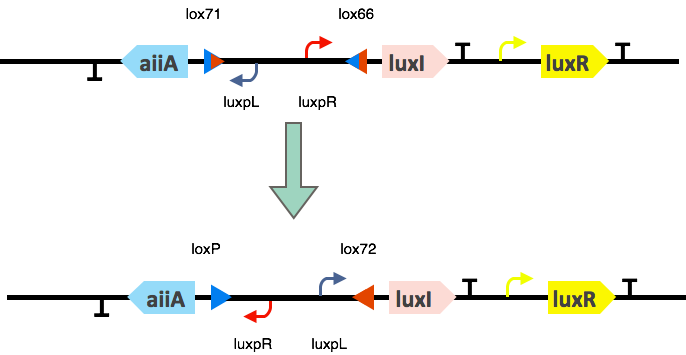 When the signal molecule AHL binds to luxR proteins, it activates the luxpR promoter and represses the luxpL promoter. LuxI synthesizes more AHL and AiiA contributes to the degradation of AHL. We used luxpR promoter to express luxI and used luxpL promoter to express AiiA (Fig. 3). Then a direct positive feedback loop and an indirect positive feedback loop formed (Fig. 4). When the inversion happens, it’s now luxpR that will express AiiA and it's luxpL that will express luxI (Fig. 3). So now more AHL will repress its own production, and will activate its own degradation. And this is a negative feedback loop (Fig. 4). Figure 5. 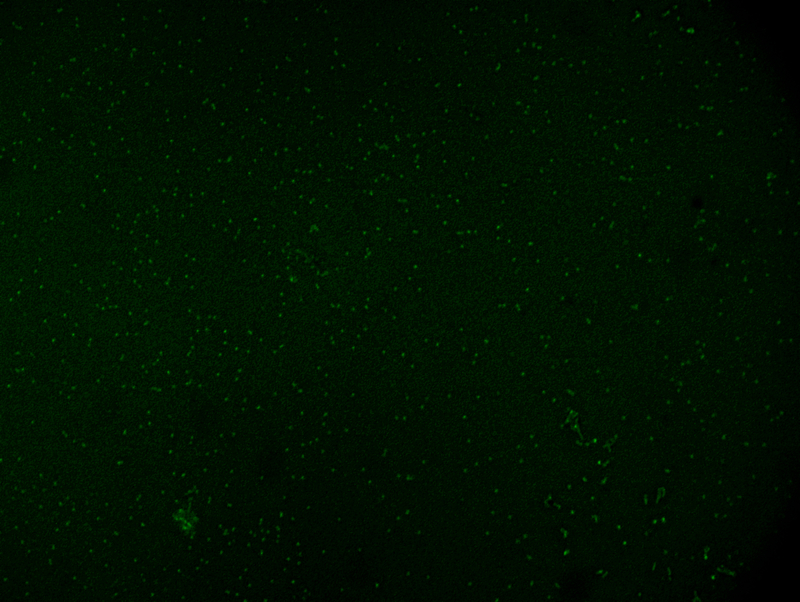 The resulting image under the fluorescent microscope. Many researches understand what orchestrates epigenomic changes by Waddington’s model of epigenetic determination of development (Fig. 6) (Mohammad and Baylin, 2010). From a dynamic view, the organism development is like jumping among different attractors. Once the cell falls into a stable steady state, it will be very hard to jump out. Many motifs in developmental network like mutual inhibition and double-positive feedback loop exhibit irreversibility unless the environment has a big change. If the gene circuit that decides the cell fate were rewirable, we could easily reprogram the cell. Figure 6. 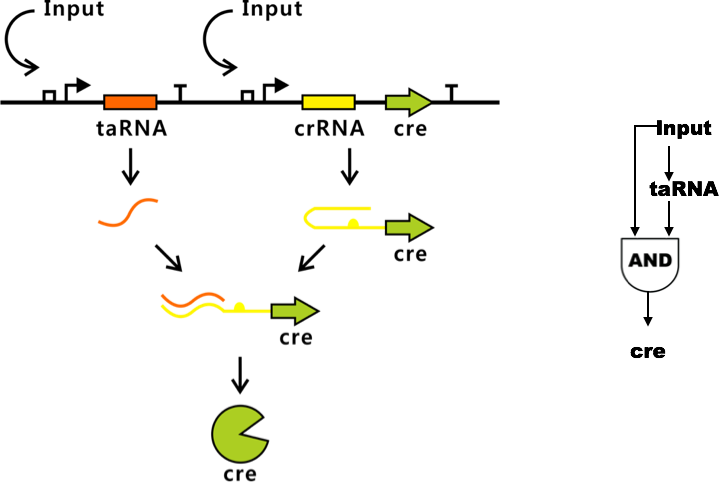 Depiction of potential cell signaling in Waddington's model of epigenetic determination of development. The tumor suppressor p53 can induce cell cycle arrest or apoptosis according to degree of DNA damage. It was reported that p53 and its downstream targets applied an oscillation mode to repair DNA damage and chose a bistability mode to trigger apoptosis once the damage cannot be fixed by oscillation mode (Zhang et al., 2011). These functions were achieved by a very complex systems (Fig. 7). Figure 7. A complex mechanism described in previous study.